打從大男孩接觸到迷你四軸飛行器Hubsan H107C後，一直在留意可以實時看到飛行器鏡頭影像的產品，亦即是FPV(First Person View) 遙控飛行。原來要實行FPV亦不是想像中的容易，飛行器需要能攜帶俱影像輸出的相機及圖像傳送設備，體積就因而激增至不方便攜帶的水平，而且要自己處理線路連接等問題，不是一般打工仔能夠抽時間鑽研的事。考慮到體積及價格等問題後，最後都是Hubsan的產品最適合我的需要。After having my first quadcopter Hubsan H107C, I am in love with this hobby and looking for a FPV solution as a next step. Traditional FPV setup requires a camera with video out function, a video transmitter and receiver, a monitor and lots of cables. It all add up to weight so you will need a bigger aircraft that not yeh direction I want to go for. Setting up the connection is also difficult too. Considering the time and money that I don't have I finally go for another Hubsan product. 這部Hubsan H107D是一件不折不扣的All-in-One產品，集遙控飛行，遙控錄影及FPV於一身，最厲害是它雖然功能多了，的體積竟然跟只能錄影的H107C一模一樣。有關遙控飛行的部分，由於它跟H107C是一樣的，可以參考大男孩之前的那篇有關H107C的文章。外觀上，它的純白色身軀很簡潔很美，飛行時比較難看見，但頗為美觀。Hubsan H107D is an All-in-One product. 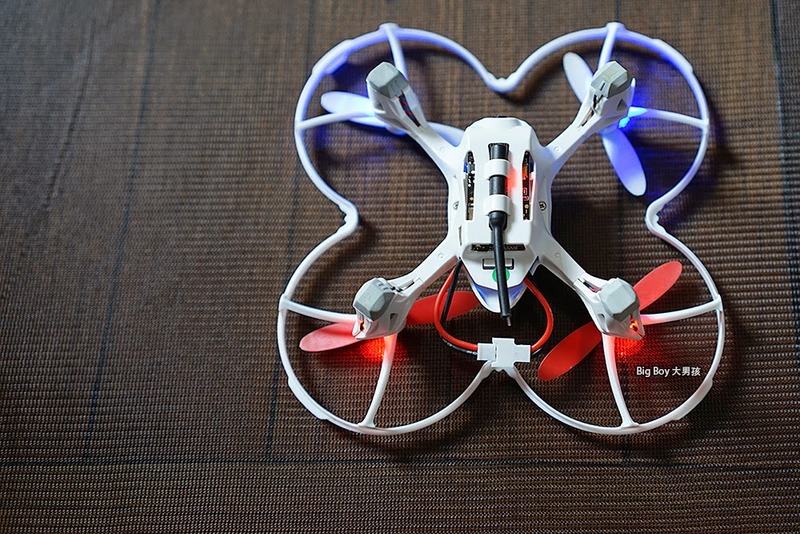 It combines radio control flying, remote video recording and FPV function together and stuff all of them into a mini-sized quadcopter. 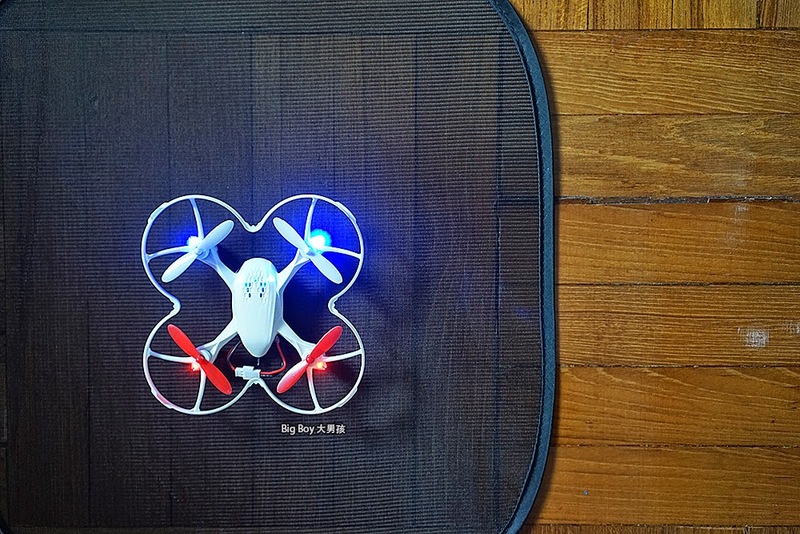 The flying part is exactly the same as H107C so you can refer to my review here. Pure white body is quite beautiful. Yet it became hard to see while flying in the air. 前白後紅的螺旋槳，配合前後不同的LED燈，幫助玩家辨別前後。Different color of the propellers & LED help user to differentiate front & back movements. 登登登登！飛行器上鏡頭的畫面會直接顯示在遙控器的屏幕上，不用外接屏幕，內置天線，非常方便。這兩隻米老鼠公仔是小女孩說要儲齊的，最後就得這兩隻...So it is how the FPV is working. The video image captured by the quadcopter showing directly on the screen of the transmitter. You don't need to know how to add external monitor. You turn both the quad & transmitter on, it just works like that! 飛行器的底部多出了一條天線，應該是負責圖像傳送的，其他跟H107C的一樣。There is an antenna on the bottom of the quadcopter for video transmission. Other than that it is exactly the same as a H107C. A：非常好，而且好方便，買回來甚麼都不用設定，充完電就玩。Yes very much fun! Charge the battery then you are good to go! 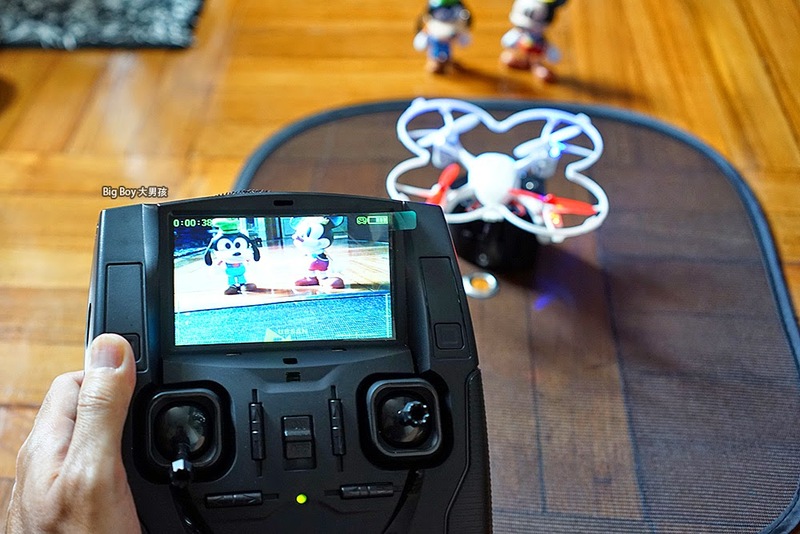 Q：FPV飛行容易嗎？Is it easy to fly FPV? A：非常難，H107D鏡頭不是廣角，所以要單純靠FPV影像估計飛行高度及跟障礙物的距離有一定難度，所以好耐玩，因為要練習很長時間。Not really! The camera is not wide angle. Just rely on FPV to estimate the attitude & distance from objects are quite difficult. So it also mean you are going to spend time on that. Q：錄影質素如何？Is the quality of video recording ok? A：不好，可能因為要遷就即時圖像傳送，錄影短片並非高清，而且它是直接儲存在插入遙控器的Micro SD卡裡，所以干擾都會被錄入短片。重視錄影質素的請考慮其他產品。在Youtube搜尋一下“H107D”就會找到大量錄影片段。No. If you want better video recording quality I will suggest H107C. The video taken by H107D is not HD format. It also go through the video transmission and record to the Micro SD in the transmitter. So you also record the noise of the transmission. You will find a lot of sample video if you search "H107D" in youtube. Q：FPV實時圖像質量如何？How about FPV Lifeview quality? A：只要附近干擾比較少，還是頗為穩定的。飛行器上的天線好像有指向性的，如果天線不是對著遙控器（例如飛行器朝著玩家飛來），畫面雜訊會出現。If there is not much interference, it is quite stable. The antenna should be directional. Noises will appear if it is not pointing to the transmitter. Q：哪裏買？多少錢？Where to buy & how much? A：淘寶有，yahoo拍賣有，廣華街模型店有，大概1000人仔左右。It costs around 1000 RMB and you can get it from Taobao.com, Yahoo Auction or RC hobby shop in Mongkok. Q：可以DIY更換鏡頭嗎？Can I change the lens to wide angle? 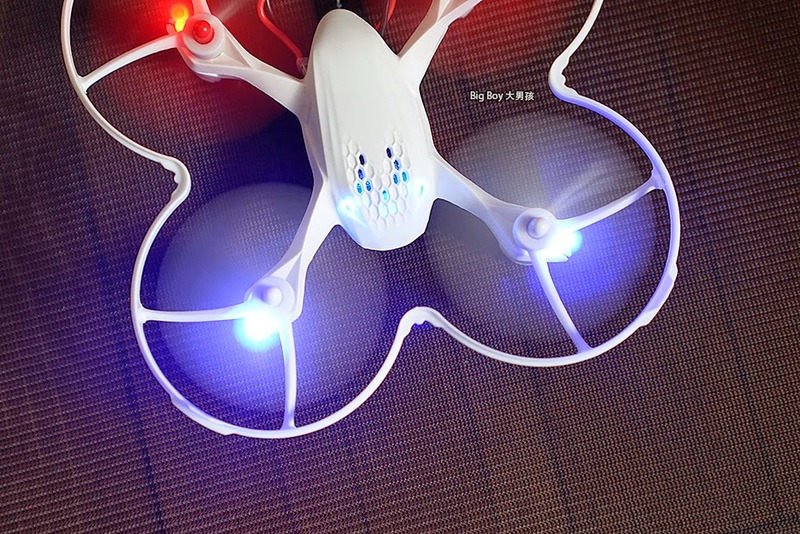 Q：電池，遙控器及保護圈能與H107C共用嗎？Can the battery, transmitter & protection ring of H107C be used on H107D?